February 2015 – Damn, I Can Make That! Before you panic at the “long” ingredient list realize it is all things you most likely already have in your pantry & fridge. Its a quick week night meal that you can bake while you change, set the table, throw in some laundry… Or maybe that’s just my game plan for tonight. Anyway, you gotta eat so might as well bake this up and give your taste buds something different than grocery store rotisserie chicken. Although trust me I am not hating, only appreciating how much our age bracket eats that stuff. Here is the picture of just dumping all those ingredients and combining. My friend made a great suggestion of serving the chicken with the pan juices although I thought the chicken was moist enough without making my plate messy with extra sauce. I am also nuts on plate presentation though so I’m probably wrong here on the taste scale. I had this at a new years eve party and its almost March and I am still thinking about it. I have problems I know. Anyway, I hit my buddy up and asked him how he made it and he turned me to this cool site. They have all sorts of recipe ideas so I went ahead and made these for a dinner party. Came out so yum, but two tips I have is to make sure the artichokes are properly dried (I had water squirt out when I bit into it, not cute and very hot!) My other tip is also in regards to moisture, make sure the chilies are dried from adobo sauce because the seeds have a lot of heat and you don’t want to over power the aioli, just give it a kick. Anyway, here is the party appetizer that will taste like a party in your mouth! *photo from Tablespoon, where this recipe idea originated from. Preheat oven to 400 degrees F. Then set up the bacon strips on a baking sheet lined with foil. Sprinkle the bacon with Parmesan. Place the artichoke heart in the center of each bacon strip. Wrap the bacon around the artichoke and, if you are clumsy and cant wrap then feel free to secure the bacon with a toothpick. Sprinkle the bites with a little Parmesan and pepper. Bake for 45 minutes, or until bacon is crispy. 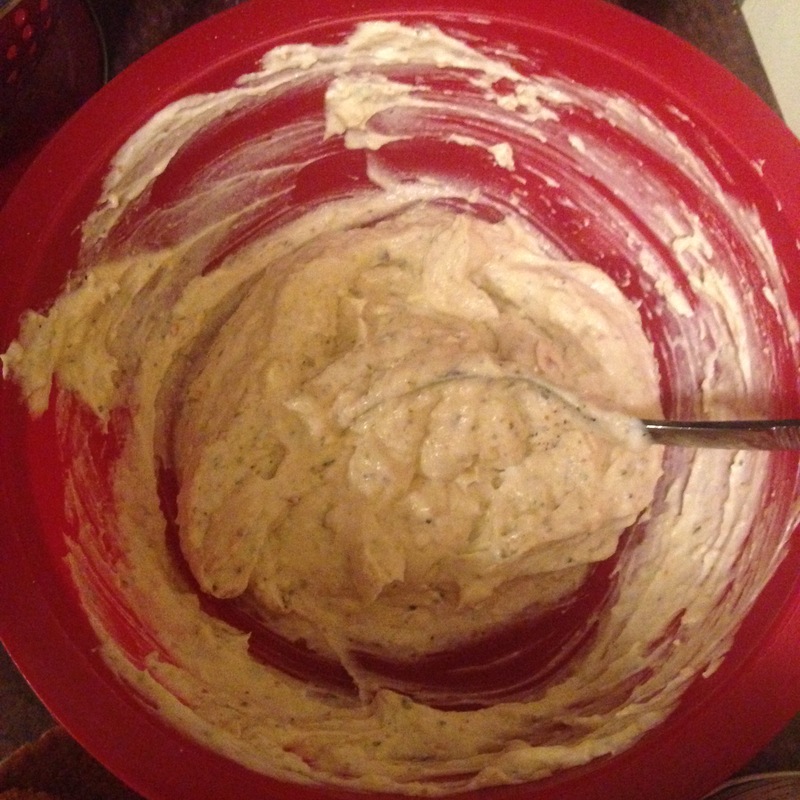 Meanwhile combine the mayo, garlic, honey, minced chipotle chiles and a pinch of pepper in a medium bowl. Stir until combined and smooth. Transfer to a dipping bowl and place in the fridge until ready to use. Hopefully everyone is full of chocolate from V-day and is now ready for eating better. As we know, fish is a staple to eating healthier, but I have a really a good twist on a basic pan seared fish recipe! I love it because its a lil sweet & spicy and I think it resonates with me/my personality. I’m a sassy girl! Overall I am sweet, but I have a lil fiery side to me as well. I also love this fish idea because it totally came out of no where when I was rummaging through my mom’s fridge over the holidays. In a small sauce saucepan simmer the chutney, soy, sriracha, garlic, and onions. This will not only marry all the flavors, but it will thin out the consistency since the chutney is chunky with pieces of mango in it. Think about 3-5 minutes. While that is happening coat the fish with olive oil and pepper (no salt really needed because of the sodium in the soy). Start to sear in a hot non-stick pan. Reduce the flame on the saute pan and add the sauce to the fish, finish cooking the filets with the sauce in pan. Approximately 10-12 min. of total cook time for fish. Not sure on the history of why this is called love cake, but I will tell you its two major components are items I love dearly: chocolate & cheese!! (It’s ricotta, chill) Anyway, it’s not super laborious, but it’s also not your traditional cake. Set aside a good amount of time to make this and it’s actually best if you make the night before serving. Also! there’s an element of magic involved. That’s right kids, magic. Preheat oven to 350 degrees. Lightly butter a 9×13 inch pan and set aside. In a large bowl, prepare your cake mix batter according to the directions on the box. Set aside. In the bowl of a stand mixer (or a super strong whisking arm like mine), beat together the ricotta cheese, eggs, sugar, and vanilla until smooth. Once the cake is cool, whisk together the pudding mix and milk until combined. Gently fold the Cool Whip into the pudding until combined. Spread the pudding mixture over the top of the cooled cake. Cover the cake and refrigerate at least 6 hours, or overnight, before serving. You know what -this cake SHOULD be called Love Cake because if I have to wait overnight to dive into this puppy I must really love you/it. 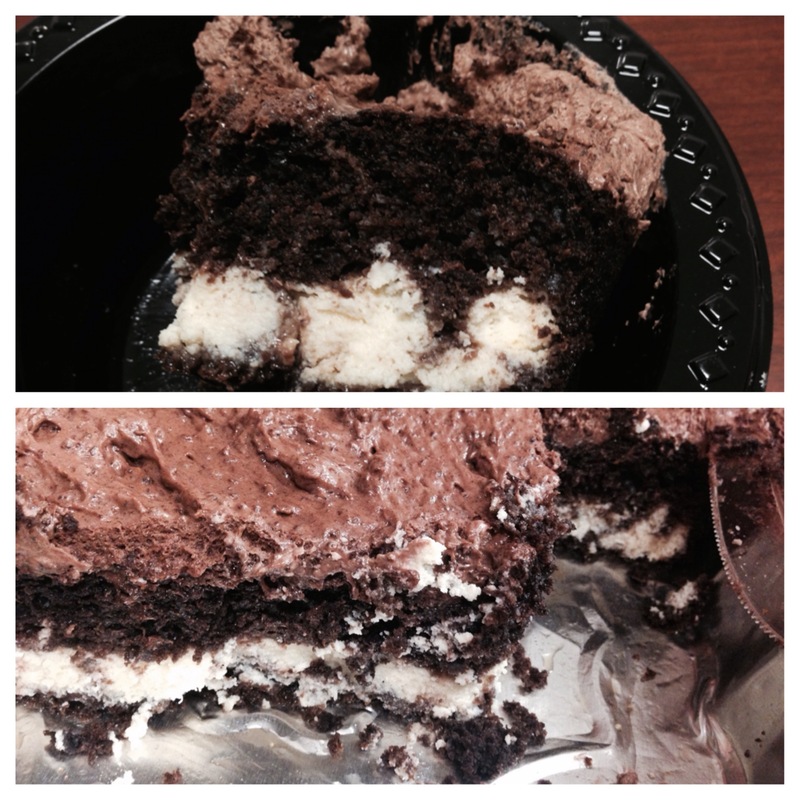 Not a very “pretty” picture but this is all I could sneak in as my coworkers devoured the cake. We are sending you all loads of Italian love this valentine’s day: tanti baci! Valentine’s Day is coming up (don’t act like you forgot gentlemen) and while flowers are really nice, we’re pretty sure your girl wants some sweets too. 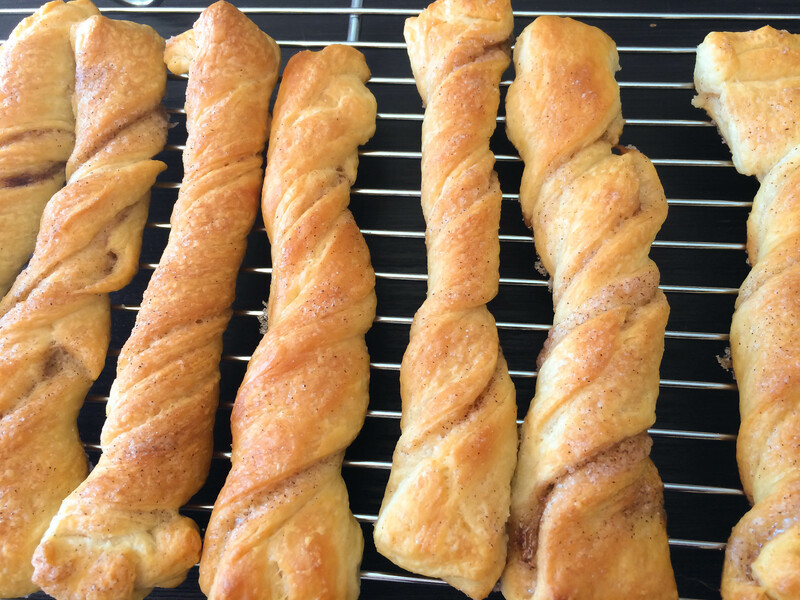 Cue these super easy and super cute cinnamon twists from Lil Luna. So easy, even a man can make them. (Yes, we went there.) Throw them in a Ball jar to make them gift worthy and you’re as good as gold. Ok, maybe not gold. You should probably go get her that gold necklace as well, just to be safe. Preheat the oven to 375 degrees and grease a baking sheet. Roll out the crescent rolls so they make four rectangles (as opposed to the triangles they want to be), pressing the inner edges together to bind them. Mix your sugar and cinnamon together and set aside. Brush 3/4 of your melted butter on to two of the rectangles, and sprinkle with 3/4 of the sugar mixture. Take the two un-buttered rectangles and lay them on top of the sugar coated ones, pressing the edges to seal them. Cut both rectangles in to six strips (I found a pizza cutter is the easiest way to do this). Brush on the remaining butter and sprinkle with remaining sugar. Lil Luna suggests baking them for 8-10 minutes but I found that mine actually took around 20 to get a nice golden brown. I was able to try a bite of them at the party and they really are heavenly!